Earlier this week I spent a few days in London: Mike Taylor and I had arranged to work in the collections of the Natural History Museum on Wealden sauropods. We have what appears to be a new taxon (more on that in future). I also took the opportunity to complete some of my research on large Wealden theropods. On the way, I stopped off and stayed with Luis Rey and his partner Carmen, and it’s the fantastic new stuff Luis showed me that I want to discuss here. I haven’t had access to my computer for a few days, so this is being posted later than planned. 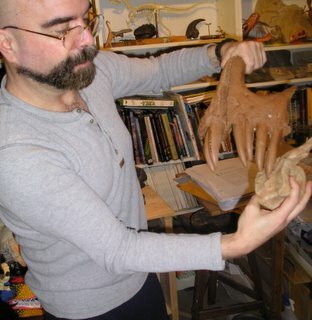 Right now Luis is very busy doing the artwork for a major new book on dinosaurs written by Tom Holtz. Judging from the art I’ve seen, it will be spectacular and one of the most attractive dinosaur books ever. Several plates depict a taxonomic panoply of a particular group, and we also have the first accurate life restoration of the bizarre Lurdusaurus, as well as new restorations of Dilong, Guanlong, Scutellosaurus and so many others. What caught my imagination in particular were his restorations of the amazing diversity of recently named oviraptorosaurs (a black-and-white version depicting this diversity has been published before (Gee & Rey 2003), but it did not include as many taxa). In fact there are now so many members of this group that it is proving difficult to keep up, and difficult to keep track of what is what, especially given that several specimens have been incorrectly allocated to a genus and later re-allocated or re-named. In fact several discoveries relevant to this area have appeared in recent months and I’ve only just done reading them, so now is a good time to review it. Most of the new taxa belong to the oviraptorosaurian clade Oviraptoridae (more basal members of Oviraptorosauria include the caenagnathids, Avimimus, Caudipteryx and Microvenator). It has been proposed that Oviraptoridae consists of two radiations: the mostly crested oviraptorines, and the crest-less ingeniines, though some recently described taxa do not fit neatly into this dichotomy. Starting with the oviraptorines, we begin with Oviraptor philoceratops, the first of them to be named (Osborn 1924). Ironically, it’s not that well known and the fact that, until recently, most Mongolian oviraptorids were assumed to be referable to this genus means that very few illustrations of Oviraptor really do depict this genus. It turns out that Oviraptor was comparatively long-skulled for an oviraptorid and it may have been the most basal oviraptorine (Clark et al. 2002). Some kind of premaxillary crest was present, but the skull is not well preserved enough to determine its original shape. Long labelled as a new species of Oviraptor is the tall-crested animal now known as Rinchenia mongoliensis. The generic name has been kicking around for a while but its formal use in a major compendium (Osmólska et al. 2004) means that it is now ‘officially’ in use. In Rinchenia the crest is mound-shaped and extends for most of the length of the skull. There is another specimen often illustrated as an Oviraptor – in fact normally labelled as Oviraptor philoceratops (e.g., Barsbold et al. 1990) – and this is GIN 100/42. It is short-skulled and sports a rounded crest decorated with lateral accessory openings. Though regarded by some as a new species of Citipati (on which see below), one unpublished study found it to be closest to O. philoceratops. Whatever, ‘because [GIN 100/42] is much better preserved than the holotype of O. philoceratops it has often been relied upon for anatomical details of this species, so caution should be used in referring to previous characterization of this species’ (Clark et al. 2002, p. 21). It’s a new taxon, whatever its affinities. Finally among the oviraptorines, there is Citipati osmolskae. This was a large animal compared to most other oviraptorids with a distinctive rostrodorsally inclined back part to the skull, a large, sub-oval naris, and a premaxillary crest that is continuous with the premaxilla’s rostral margin (Clark et al. 2001). The famous ‘big momma’ specimen (an animal preserved atop an egg-filled nest), and an embryonic specimen, also appear referable to Citipati. The embryo is significant in that it was the specimen that demonstrated that most/some eggs attributed to Protoceratops were actually oviraptorid eggs. I don’t have time to cover that story in depth now, and it’s reasonably well known now anyway. Not all studies agree that Citipati is an oviraptorine – it may instead be an ingeniine. We move now to the ingeniines, a group separated from oviraptorines by Rinchen Barsbold, mostly due to differences in hand structure (Barsbold et al. 1990). Barsbold later thought that ingeniines were distinct enough to deserve their own ‘family’, Ingeniidae, though this has not been supported by more recent studies. The type taxon of the group is 'Ingenia' yanshini, a small, robust species (‘small’ = c. 1.5 m long) with particularly short arms, a massive thumb, and robust, short feet. It has recently been discovered that the name 'Ingenia' is preoccupied, and this explains the quotes used here. A replacement name will appear at some stage, but hasn't done so yet. Rather similar to 'Ingenia', though more gracile, is Conchoraptor gracilis. The short, rounded skull of this species has been illustrated and labelled several times as representing Oviraptor, though it is clearly distinct from that taxon. It has a distinctive subvertical, dorsoventrally elongate naris. Khaan mckennai*, described for two outstanding complete skeletons, is similar to Conchoraptor but has a more horizontally-aligned naris and more strongly curved manual unguals (Clark et al. 2001). *If I remember correctly, the ICZN prefers it if 'Mc' names are converted to 'mac' spellings when used in binomials. If this is right, then the specific name here should really have been 'mackennai'. As an example, the ichthyosaur Macgowania was named for Chris McGowan. Also probably part of Ingeniinae is Heyuannia huangi, a taxon named in 2002 and known from at least four individuals, one of which is an almost complete skeleton (Lü 2002, Lü et al. 2005). It was also small (less than 2 m long), crest-less, with a longer neck and shorter back than other taxa, and a particularly long ilium. The most recently named oviraptorid is Nemegtomaia barsboldi from the Maastrichtian Nemegt Formation (Lü et al. 2004, 2005). Lü et al. (2004) originally named this taxon Nemegtia, but that turned out to be preoccupied by an ostracod from the Nemegt Formation (shades of 'Ingenia'). Nemegtomaia is reasonably well known, with a near-complete skull. Prior to this, the specimen had been figured, but identified (without good reason) as a new specimen of 'Ingenia' (Lü et al. 2002). However, unlike 'Ingenia', Nemegtomaia is an oviraptorine, and it’s probably closely related to Citipati. We also have Shixinggia oblita from the Maastrichtian Pingling Formation of Guangdong Province, China, and known from pelvic, hindlimb and vertebral material (Lü & Zhang 2005). The affinities of this taxon are uncertain – it may be a caenagnathid and not an oviraptorid. For various reasons I’m very interested right now in postcranial pneumaticity, and for this reason I’ll say that Shixinggia (and Heyuannia) are particularly interesting. More on that later. Also on the subject of caenagnathids, there is Hagryphus giganteus, just described from the Campanian Kaiparowits Formation of Utah (Zanno & Sampson 2005). Though only known from a hand, a fragmentary distal part of a radius and some fragments from the foot, it’s clearly distinct from other North American taxa. It was large – bigger even than Chirostenotes (and ‘large’ here means >3 m long). And this isn’t the end of it as at least a few other taxa (mostly oviraptorids) have been figured in the literature and appear to represent valid taxa, but have yet to be named or described. The expanding taxonomic sample and diversity of these animals is the exciting area that I’ve covered here, but there’s so much other interesting stuff that could be said about oviraptorosaurs. There’s what we know of their reproductive behaviour (gleaned from nests with eggs and even shelled eggs discovered inside a pelvis), the affinities and anatomy of the basal forms from Lower Cretaceous China (Caudipterx, Protarchaeopteryx and Incisivosaurus), the controversy over their diet and ecology, their controversial phylogenetic position (some workers maintain that they are flightless birds*), and the controversy over their alleged presence in the English Lower Cretaceous (Naish & Martill 2002). *Let me take this opportunity to point out that analysis of the data indicates that this view is erroneous, and that these theropods are outside of the clade that includes archaeopterygids and modern birds. In the photo above, Luis is holding a caudal vertebra from a hadrosaurid that bears a deep score mark across its surface. The score mark matches precisely the dimensions of a tyrannosaurid premaxillary tooth tip, as Luis is demonstrating with the help of a handy set of tyrannosaurid premaxillae he just happens to own. Awesome stuff. So what happened when I actually got round to doing some work? News on that soonish. It’s snowing here. Barsbold, R., Maryańska, T. & Osmólska, H. 1990. Oviraptorosauria. In Weishampel, D. B., Dodson, P. & Osmólska, H. (eds) The Dinosauria. University of California Press (Berkeley), pp. 249-258. Clark, J. M., Norell, M. A. & Barsbold, R. 2001. Two new oviraptorids (Theropoda: Oviraptorosauria), Upper Cretaceous Djadokhta Formation, Ukhaa Tolgod, Mongolia. Journal of Vertebrate Paleontology 21, 209-213. - ., Norell, M. A. & Rowe, T. 2002. Cranial anatomy of Citipati osmolskae (Theropoda, Oviraptorosauria), and a reinterpretation of the holotype of Oviraptor philoceratops. American Museum Novitates 3364, 1-24. Gee, H. & Rey, L. V. 2003. A Field Guide to Dinosaurs. Quarto Publishing (London), pp. 144. Lü, J. 2002. A new oviraptorosaurid (Theropoda: Oviraptorosauria) from the Late Cretaceous of southern China. Journal of Vertebrate Paleontology 22, 871-875. - ., Dong, Z., Azuma, Y., Barsbold, R. & Tomida, Y. 2002. Oviraptorosaurs compared to birds. In Zhou, Z. & Zhang, F. (eds). Proceedings of the 5th Symposium of the Society of Avian Paleontology and Evolution. Science Press (Beijing), pp. 175-189. - ., Tomida, Y., Azuma, Y., Dong, Z. & Lee, Y.-N. 2004. New oviraptorid dinosaur (Dinosauria: Oviraptorosauria) from the Nemegt Formation of southwestern Mongolia. Bulletin of the National Science Museum, Tokyo, Series C 30, 95-130. - ., Tomida, Y., Azuma, Y., Dong, Z. & Lee, Y.-N. 2005. Nemegtomaia gen. nov., a replacement name for the oviraptorosaurian dinosaur Nemegtia Lü et al., 2004, a preoccupied name. Bulletin of the National Science Museum, Tokyo, Series C 31, 51. - . & Zhang, B.-K. 2005. A new oviraptorid (Theropod [sic]: Oviraptorosauria) from the Upper Cretaceous of the Nanxiong Basin, Guangdong Province of southern China. Acta Palaeontologica Sinica 44, 412-422. Naish, D. & Martill, D. M. 2002. A reappraisal of Thecocoelurus daviesi (Dinosauria: Theropoda) from the Early Cretaceous of the Isle of Wight. Proceedings of the Geologists’ Association 113, 23-30. Osborn, H. F. 1924. Three new Theropoda, Protoceratops Zone, central Mongolia. American Museum Novitates 144, 1-12. Osmólska, H., Currie, P. J. & Barsbold, R. 2004. Oviraptorosauria. In Weishampel, D. B., Dodson, P. & Osmólska, H. (eds) The Dinosauria, Second Edition. University of California Press (Berkeley), pp. 165-183. Zanno, L. E. & Sampson, S. D. 2005. A new oviraptorosaur (Theropoda, Maniraptora) from the Late Cretaceous (Campanian) of Utah. Journal of Vertebrate Paleontology 25, 897-904. Damnit, Darren, give a man a head's up! Nemegtomaia!!! BTW, have you another email address? I've sent some articles to you, but it's your institutional Portsmouth address, and no reply as yet. You mean you didn't know about Nemegtomaia? Shame on you Jaime, shame. I've been receiving your spinosaur emails if that's what you're referring to, but as yet haven't had the time to reply. Is there other stuff that I've missed? Science papers from Tokyo and small journals from China and the SE Asian countries tend to take a few months to hit the west, at least for us who don't get the journals that I know the Kensington, London and Oxford libraries DO. Nonetheless, people need to voice these. Hm, well, I'm not exactly in the habit of perusing 'London and Oxford libraries'! But I take your point. Unfortunately I ceased telling the world about new dinosaur papers when I left DML.